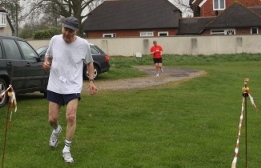 This month's race coincided with Easter and so was run half an hour earlier than usual. The weather proved ideal for running, but less so for standing around waiting to start (or, indeed, for marshalling). Grey and dismal, in other words. Despite the unappetizing weather and the Easter holidays, 11 runners turned up to run and we were pleased to welcome two new runners: Ali Lowry and Andrew Gibson, numbers 66 and 67 respectively. First runner in was Ali Lowry, running off a pessimistic estimate, so the most improved runners were Sandra Jones and Jeffrey Wiseman. Well done to you both. Nearly everyone improved on their previous run, Sandra and Jeffrey by over a minute each. Thanks very much to David and Ben for timekeeping; Jack for finish-line marshalling and prize giving; Maggie for the cakes and tables; David and Fiona for the signs; the other Fiona for being coffee-monitor and for the photography* and the Cricket Club for the venue. * Blame the size and blurriness of the pictures on David's post-processing. Full-quality versions available by emailing the usual address.